This image is made from 21 images taken with two different cameras on color negative film. Excellent observing conditions and the Sun not far from the zenith enabled to create an image of very good quality. The faintest star visible in the image is of magnitude 6.2. Processing Composition of 21 images, (1) 13 images 24×36 mm, (2) 8 images 6×6 cm. 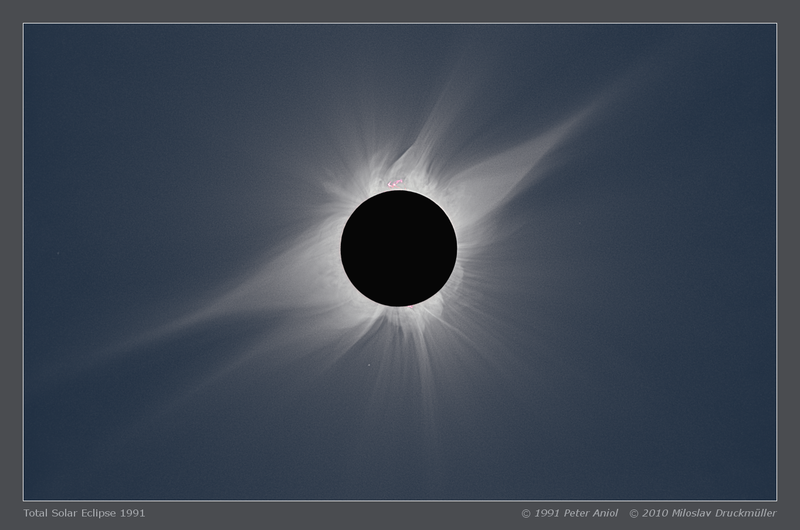 Images were aligned by means of phase correlation, composed by means of FilmCMP 2.0 software, processed using Corona 4.1 in order to visualize coronal structures. Final processing was done using ACC 6.1 software. Note The graph above the table shows the average values of the relative number of sunspots in which the red arrow indicates the time of 1991 eclipse. Graph was created according to data from Sunspot Index Data Center, Brussels. Orientation Image must be rotated 92.7° anti-clockwise to achieve standard orientation i. e. solar North up.